Phoebe DiSalvo-Harms, Humanities Librarian (left), and Emily Adydan, student worker for the library (right), welcome readers as discussions between books and readers happen behind them. 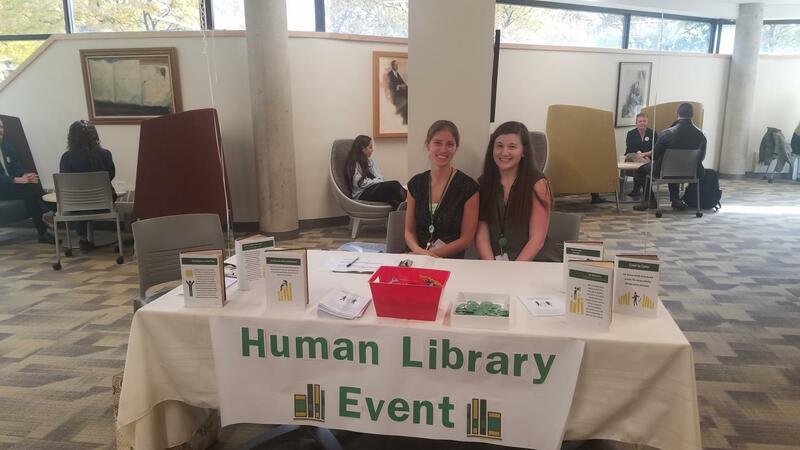 The Human Library grew to greater success in its second year. On Nov. 2, human books could be checked out, so their stories could be told to readers. The mechanics of the event were identical to last year, but the event itself gained more popularity. Humanities Librarian Phoebe DiSalvo-Harms said this year was more successful in terms of visitors. “In the first hour, we had more people than last year altogether,” DiSalvo-Harms said. There was a wait time of approximately 20 minutes for books due to high demand. She thinks this is because of increased advertising and heightened interest. Student workers were very involved in the advertising process. Emily Adydan designed the fliers and posters, and Deanna Pomeroy did most of the social media advertising. On the library Instagram, there were four posts leading up to the event, and an Instagram story being updated during the event. The event was free for the college. The librarians initially got 11 volunteers. This number was originally reduced to eight, then to six due to last minute cancellations. This year, there were 22 readers who checked out books. Some individuals checked out more than one, resulting in 25 separate checkouts. This was a large increase from the seven readers they got last year. The participants had complete freedom with the topics they wanted to discuss. They decided what they wanted to share, the title of their book and the description. Readers could browse the options in brochures made by the library staff. The library welcomed more difficult topics. The most popular books were Forgive Me, Daddy, for I Have Sinned: Confessions of a Gay Catholic, and The Overcomer and Her Healing Process. Some of the topics highlighted in these books included sexuality, religion, trauma, and pain. Bennie Williams, the director of the Office of Inclusive Excellence and Global Education, planned and participated in the event. He checked out books as a reader. He found the event enlightening and said despite his standing relationships with participants, he learned so much. “Even knowing some of the students, I learned so much more than I thought I knew. There is so much more history to each of these people,” Williams said. Both Williams and DiSalvo-Harms said that this process of conversation is beneficial to both readers and books.